The Women’s 10k is one of my favourite events in the race calendar. I first took part in 2013 then returned in 2014 for a PB, however couldn’t manage last year as the date just didn’t work out for me around my other training/racing commitments. This year, however, the date moved from mid-May to early June, and with nothing else in particular to train for, I thought I’d give it a go. I knew I was nowhere near 10k PB form, but I also thought it would be a useful benchmark of where I am right now (as well as a chance to earn a bit of bling!). I left it fairly late, only signing up a couple of weeks in advance, and my race pack only arrived two days before the race, but these days I’m reluctant to sign up for races too far ahead, just in case! As well as the change of date, there was also a change of route this year, so it was exciting to see how that would work out. Instead of running through residential streets and a couple of Glasgow’s parks, the route would now begin near the University (my alma mater), making its way down to the riverside then snaking back again. Like the previous route it would be almost a loop, starting and finishing at different sides of a park. Knowing Glasgow, I knew this would mean a fairly steady uphill to get from the river back to the university and so a good test of my fitness. With the race due to start at 10:30am, an 8am departure from Perth was in order. Steve was originally going to drive me through however amid some logistical wrangling to allow him to fit in a run too, I was offered a lift through with some other runners I know so decided to go with them and let Steve have his run. We met at the Park & Ride not far from my house and set off for Glasgow, chatting all the way as we had not all seen each other for ages, which made the journey pass quickly. Soon, we arrived in Glasgow and parked right by the building I used to have my lectures in! We were meeting someone else there, so there was time to pop to a well-known coffee chain for a pitstop before sorting ourselves out and walking the 10 minutes down to the race start where we joined the toilet queue then headed off into the park to find the bag drop. It was forecast to be a warm day, but under the shade of the trees it still felt a bit cool as we walked back to get into our starting wave. In the past, participants have been assigned to a wave based on their predicted finishing time. This has usually seen me in the front wave with my predictions of below 1 hour (this race attracts a lot of first-timers and groups just looking for a fun day out). This year, that changed with the novel idea of “musical” start waves. Instead of time-based waves, participants could pick a wave based on the music they would like to set off to – 80s, 90s & 2000+ – as well as a “time focus” wave for those wanting to take things a bit more seriously. We were all in the time focus wave, but even then we soon realised that this would mean runners of all different abilities would be in every wave, meaning that there would likely be a bit of weaving to get started. There was, of course, one of those awful mass warm-ups where 5000-odd participants attempt to join in whilst squeezed into a space the size of a postage stamp! It’s a wonder we didn’t all end up with squished toes as we jumped around and tried in vain to follow the instructors who were on a raised platform just slightly too far away. Still, it passed the time and the choice of music was good. There was then a few more minutes to wait as the course was checked one last time, then some intense music was played to get us all focused and excited before the horn sounded. Unsurprisingly, the start was a little crowded and I did notice a few women who began walking within the first kilometre, causing a bit of weaving. The first couple of miles were undulating, with a few out and back sections. The temperature was rising, but there was a fair amount of shade and I kept a decent pace, feeling pretty comfortable. But the closer we got to the river, the hotter it became and from halfway we were running in direct sunshine (which was also reflecting off the water) with no respite. I had been averaging around 8:30 per mile, but this soon began to slow as I got hotter and hotter. I grabbed some water at 6k, drank some and poured the rest down my back to cool me down a bit. Around 8k there was a bit more shade and the welcome sight of a water mister. A few runners avoided it, but I made a bee-line straight for it, knowing it would be refreshing and give me a bit of a boost for the last of the race. As I ran through the mist all I could hear was the other runners around me letting out grunts and sighs of relief as the cool water hit their warm skin. It fogged up my sunglasses a bit, but it was definitely worth it! From there, we had to gradually make our way back up hill again. There were also some more switchbacks and out and back sections which sometimes made it difficult to work out if the runners you could see heading the opposite way were ahead or behind. Fortunately, there were also lots of spectators along this part of the course shouting encouragement to keep us going. On a cooler day it probably wouldn’t have bothered me so much, but we Scots aren’t really conditioned to running in the heat as the weather is so changeable. I have been running in warmer weather, but not racing, so that made a difference for me. Still, I was 511th out of around 4750 finishers and 110th out of around 1000 in my age category. Can’t be too upset with that! Our group had pre-arranged a meeting point and had no trouble finding each other. There was lots on offer in the park including food trucks, massages and yoga sessions which sounded pretty tempting, but we were keen to get home so after a group photo we collected our bags and headed back to the car. One last coffee chain pitstop for the road and we were on our way. Once home, it was time for the requisite check of the goody bag: water, Lucozade, food, foil blanket (DEFINITELY not needed! ), multivitamin sample, magazine, leaflets. I’m not yet sure how I feel about the new course. On the day, we all agreed we found it tougher than the old one, although it was also a much hotter day which had an impact. I think a part of me missed running through the leafy parks and there were also some parts where the support was a bit sparser compared to the residential areas we used to go through. I’m also not sure about the musical waves. It’s a nice idea for those out to have fun, but for those looking to get a good time (which could be anything from 35 minutes to 2 hours depending on the individual) this setup may not be the most conducive as each wave seemed to have the same range of pacers. That said, the event was very well organised, the start/finish areas were well signposted, the marshals and other staff were very good and the goody bags were decent. Overall, I think the race is good value for money and would have no objections to taking part again. In fact, entries for next year are already open if you fancy it…! 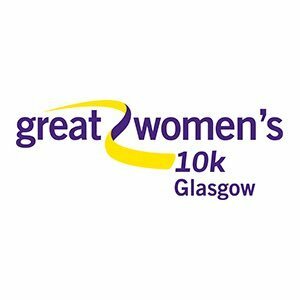 This entry was posted in Race Reports, Running and tagged 10K, fitness, Glasgow, postaweek, race, running by The Running Princess. Bookmark the permalink. Great race on a hot day! Minnesotans aren’t use to the heat either, we melt! I’d love the chance to get used to it!